Most players will need to play their tee shot right of the fairway bunkers. But, challenging the bunkers for a longer player will leave a short iron or wedge into the green. Avoid being long on the second as the back of this green is very unfriendly. This challenging par 4 is a slight dogleg right. The undulating fairway creates many challenges on the approach which will normally play into the prevailing south breeze. 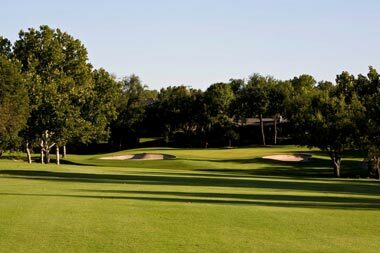 The green, which is guarded by bunkers in the front, slopes drastically from front to back requiring supreme accuracy. Favor the left side on your tee shot as this gives you the best angle into the green. The second shot is extremely challenging with the green running away from you. Anything on the putting surface gets you on the way to a par. The third hole is a challenging, middle length par 3. 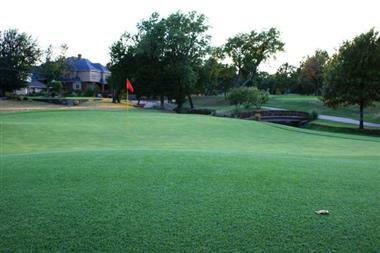 A well struck tee shot will leave you facing a treacherous green complex. A two putt from anywhere on this green should be welcomed. Trouble surrounds this plateau green on all sides, accuracy is a must. 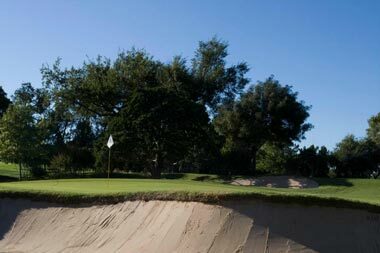 Aim for the middle of the green, taking an extra club will ensure you steer clear of the challenging bunkers guarding the front. 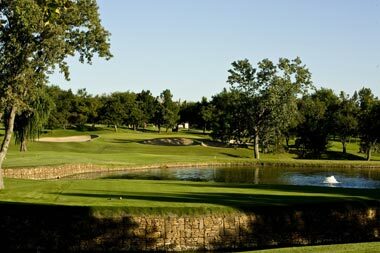 A par is a great score on this beauty of a par 3. 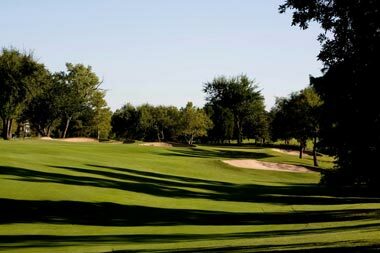 Two of Perry Maxwell's signature design features are evident in the fourth hole, a drive to reach the corner of a dogleg and a downhill approach shot. 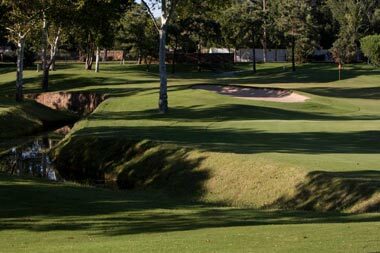 The tee shot on this hole requires a well struck drive to reach the corner of the dogleg left while avoiding the rugged terrain and fairway bunkers placed left of the fairway. The second shot plays downhill to an idyllic lakeside green setting that is protected by bunkers left and right. The tee shot should be played safely right of the fairway bunkers. Being too risky with the tee shot will result in a difficult recovery from even more challenging terrain. 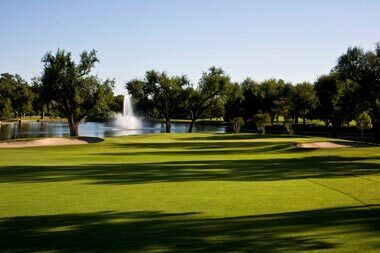 The lake doesn't come into play as long as you ensure the correct yardage on your approach. Once on the putting surface, the back left portion of the greens runs towards the lake, so a putt in this direction is very quick. 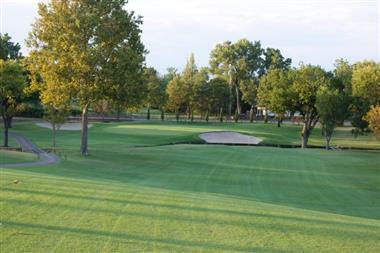 The first of three par 5's at Oklahoma City Golf and Country Club is a stern three shot hole. The fairway bends slightly right, then back to the left. Trees line both sides of the fairway rewarding well placed tee shots and testing stray drives. 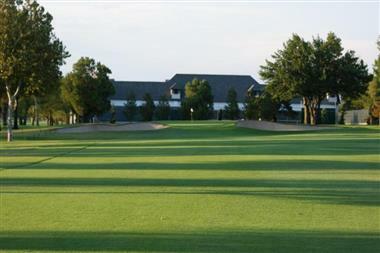 The green complex sits below the fairway and is hidden by a knoll on the left. A bunker guards the right side making this a very challenging approach. This is a definite three shot hole, so don't be too aggressive with the drive. A good layup will leave a short iron into this green. The knoll short and left of the green will help a wayward third shot funnel towards the putting surface. One should take caution as the third shot will play downhill and downwind, trouble awaits long of this green. 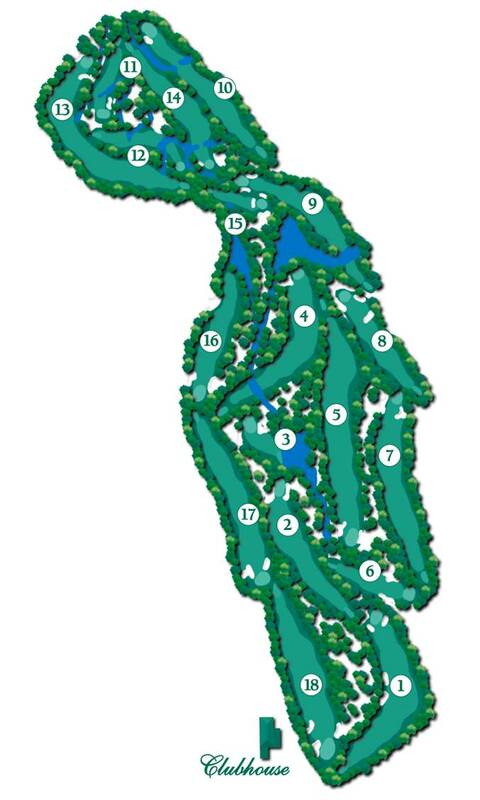 The sixth hole is a strong medium length par 3. The green complex sits drastically uphill from the tee. The green is guarded in the front by bunkers on the left and right. A well struck tee shot is pivotal to a good score on this hole. The tee shot play a solid one club uphill. If the prevailing wind is blowing, add a half club to the tee shot. The green slopes fairly drastically back to front, so putts can get tricky. Par is a good score here. 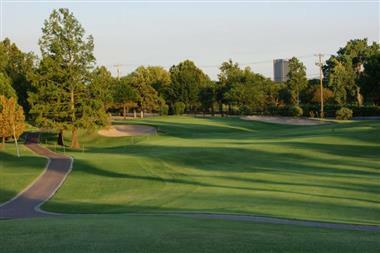 The undulating fairway of hole number seven makes it extremely challenging. 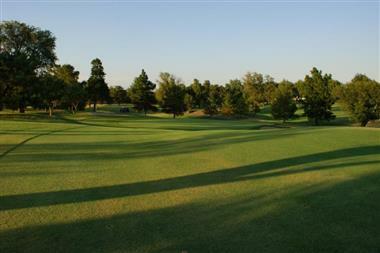 This par 4 is a dogleg right, a well placed tee shot down the left side ensures a clear view of the green. The approach is then uphill to a green surrounded by runoff areas and two bunkers in the front left and right. 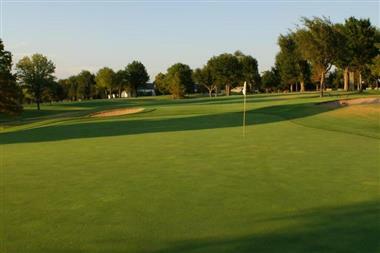 One of the most challenging greens awaits as you try to get to the next hole with a par. Keep your tee shot down the left side, this is the flattest area of the fairway so you should get a better lie for your approach. Missing short is better than long as over the green is a near impossible up and down. The eighth hole is a short, but very tricky par four. The unique thing about this hole is the options you have in playing it. The hole plays slightly down hill, then back uphill. There is a fairway bunker guarding the landing area on the right side of the undulating fairway. Two greenside bunkers guard the left front of the green, while another guards the right. This hole can be played two ways, a layup short of the bunker on the right, leaving a flat lie and a short iron into the green. Or, the longer hitter can have a go at the green off the tee. Trouble awaits right with tall grass and trees. With confidence in your bunker play, a great miss would be in the bunkers short, left of the green. A well struck drive is required to reach the corner of this uphill, dogleg left par 4. The approach shot is the drastically downhill to a green protected left and right by bunkers. The prevailing south wind creates prominent challenges on the tee shot and the approach. This is a very challenging tee shot, care must be taken as a drive in the left side of the fairway will not have a clear shot to the green on the approach. The safest play off the tee is down the right side, leaving a slightly longer approach. Shots landing short of this green have a decent chance to run onto the putting surface. The first hole of the back nine is a straightaway par 4. The uphill tee shot is blind, the fairway is tree-lined on both sides. Trouble will come into play on the tee shot up the right side. The approach is then downhill to a green guarded by bunkers and the first of many creeks that come into play on the backside. The tee shot should be played down the left side of the fairway. The farther you hit your tee shot, the more the trouble on both sides comes into play. If your tee ball lands in the trees, take caution on your punch out to avoid the creek short of the green. The second shot will play downhill, so less club is needed on your approach. Number 11 is a fairly straightforward par three. The signature creek on the back nine winds its way throughout this hole. The creek comes into play on the right, in front, and on the left of this green. The green is guarded on the left and right with bunkers that come into play. The prevailing south wind will help slightly with club selection, but long is definitely better than short. 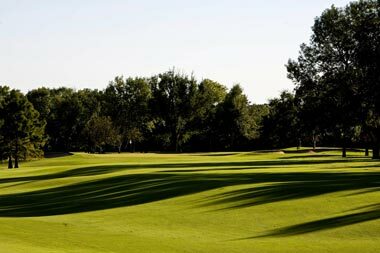 A par is a great score on this long par three. Many words can be used to describe this unique par 4. The thinking man will love this hole as options abound. The hole doglegs sharply to the right. A well placed layup at the fairway bunker will leave you a short iron to a wedge into the green. The green is guarded to the left and right with bunkers. 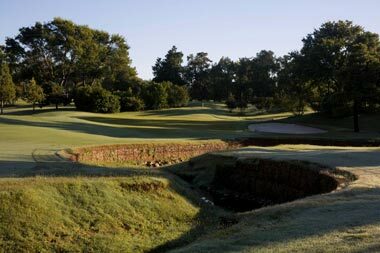 The signature creek once again winds throughout this hole as it crosses the fairway twice and awaits near the left side of the green complex. Bunkers also guard the left and right of the fairway and green. A mid to long iron is the smartest play off the tee. Avoid the fairway bunkers and be either long or short of the slope between the bunkers. This will leave a short iron approach. The farther you hit your layup, the clearer your approach will be to the green. The ideal look is from the top level of the fairway, playing a slightly downhill approach. This boomerang par 5 starts with a fairly straightforward tee shot. This tree lined fairway slopes gently to the right, with out of bounds waiting down the right side. The second shot can be tricky. 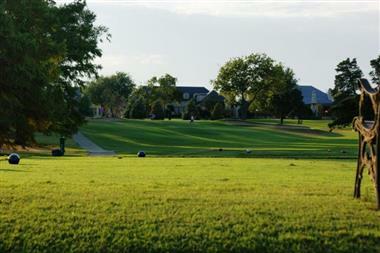 The fairway takes a sharp dogleg right, then goes downhill to the green complex. Two bunkers in front guard approaches landing short, while the creek waits on the right and behind the green for more errant shots. The green complex can, essentially, be split in three separate sections making lag putting very difficult. The smartest way to play this hole is three shots, each of them played down the left side of the fairway. Driver down the left side, layup down the left side, and this should leave you a clear shot to the green. Care should be taken on the layup shot, anything drifting to the right side of the fairway will leave you behind trees with no shot to the green. The 14th is a great par four that slightly doglegs right. The first section of the fairway goes uphill, then drastically downhill on the approach to the green. The creek once again comes into play in front of the green. 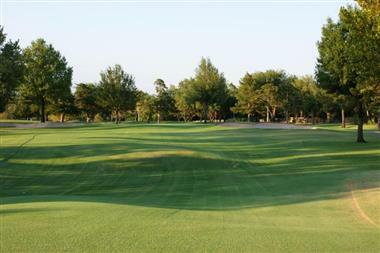 Bunkers guard the front-right and left sides of this green complex. 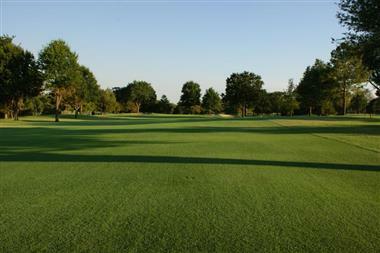 A good drive down the middle of this fairway will set you up with a mid iron to the green. A fantastic hole from Perry Maxwell showcases one of his favorite design features, a drive to a plateau and a downhill approach. The longer hitters may be able to reach the apex of the plateau leaving a wedge into the green. The 15th is the shortest par three on the course. But don't let the friendly yardage fool you as trouble abounds. Bunkers surround this green, leaving almost any errant approach with a tough up and down from a bunker. The left side of the green runs off into a collection area, so be wary of this when putting and on your tee shot. The prevailing south wind will help make this hole a little bit shorter. A miss short is not ideal, but better than long as you will be playing uphill. The putting surface can be tricky, so be careful with those lag putts. This picturesque par 5 starts with a slight dogleg left. Water frames this hole on the left, but does not really come into play. Two fairway bunkers will test your accuracy off the tee. 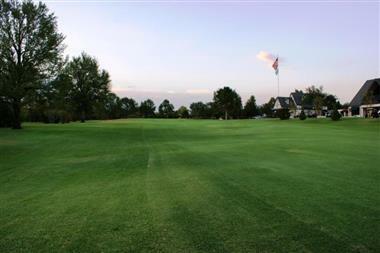 The fairway is extremely undulating, leading to a rolling green complex. The green is surrounded by bunkers left and right. Any drive at or left of the fairway bunkers should leave you in good position. The undulating portion of this fairway is placed right in the layup area. Caution should be taken to avoid the most extreme parts of this fairway as it could leave you a very uneven, difficult lie. The 17th hole is a slight dogleg right. A single tree on the right side of the fairway forces the tee shot down the center to left side of the fairway. With the prevailing south wind, the hole will usually play downwind. The green is protected with bunkers on the left and right of the approach shot. The green is sloped from back to front, and from right to left. Favor the left side off of the tee, large trees and Out of Bounds on the right side will prevent you from being too aggressive into the well protected green. The bunkers around the green are deep and will come into play on the approach shot. A good drive down the left side will leave a short iron to wedge to the green. This is a great finishing hole with trouble lurking right and left off of the tee box. A good drive down the middle of the fairway will leave you a mid to short iron into a green that sits above your approach. The green is protected with bunkers on the right and left. This green is close to the largest putting surface on the golf course. The tee shot is the key to making par or even birdie. A good tee shot will leave a mid iron to an uphill green that is large in size. Make sure you have the correct yardage into the green because it can play up to three clubs different with a front, middle, or back pin location. Making par on this 18th hole will make up ground in most groups.